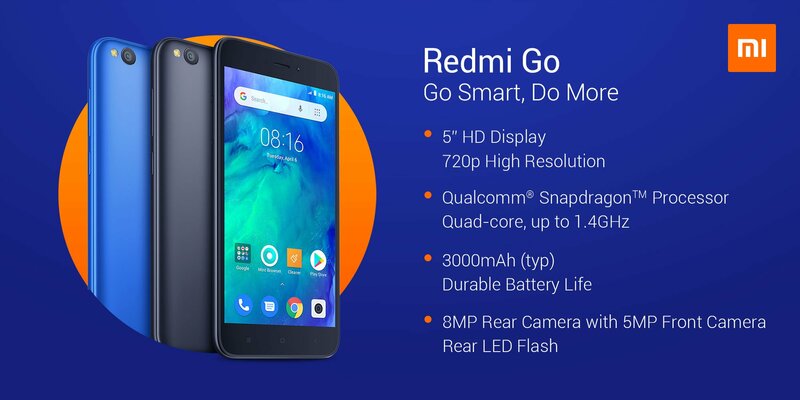 Today, Xiaomi announced the Redmi Go for the European market and it is the first smartphone from the company with the Android Oreo Go Edition. Also, this is an entry-level phone with a price tag of just €80 for the European market. 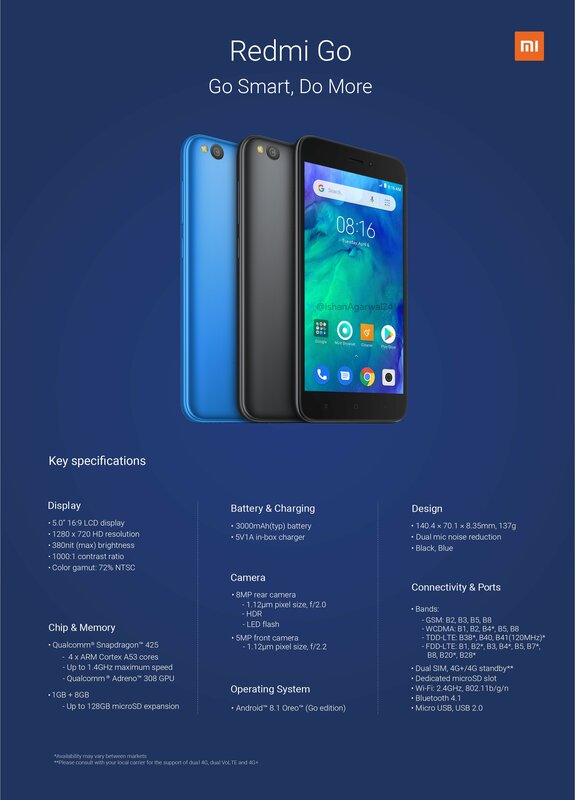 There is, however, no official word from the company on the launch in other markets like India. According to some sources, Xiaomi will launch three phones in India soon, the Redmi Note 7, Note 7 Pro and the Redmi Go. 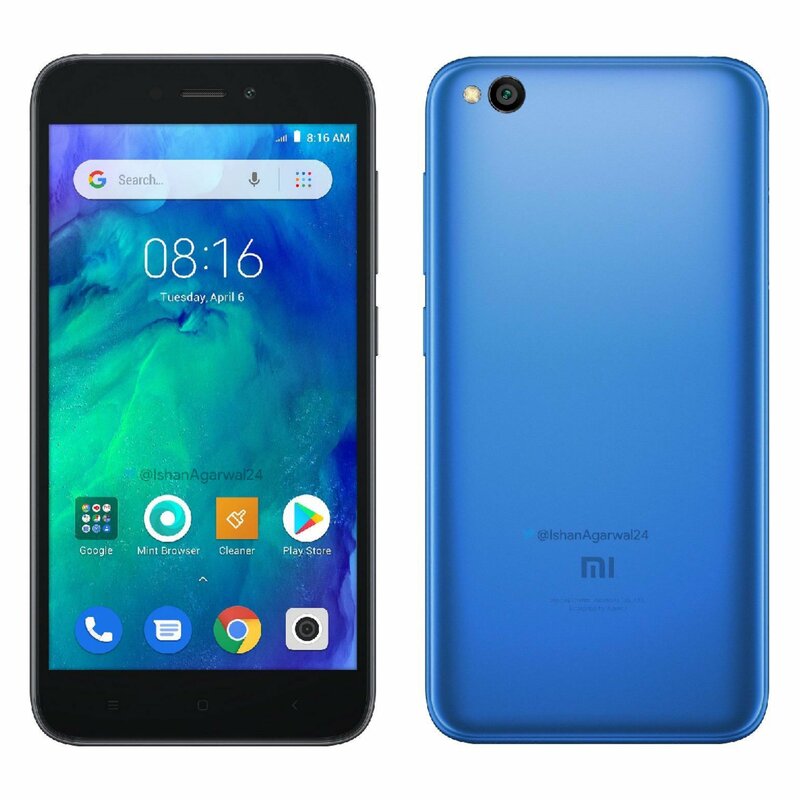 So, the Xiaomi Redmi Go is a normal looking phone with a plastic build, a single rear camera, no fingerprint scanner, a 16:9 display on the front (and hence hue bezels), a micro USB port, etc. There is a 5-inch HD display (1280 x 720) with an aspect ratio of 19:9. The processor under the hood is the Qualcomm Snapdragon 425 which is a quad-core processor clocked at 1.4GHz. The Redmi Go comes with 1GB RAM and 8GB ROM that is expandable up to 128GB. The phone has a single 8MP f/2.0 rear camera and a 5MP f/2.2 front camera. Underneath, there is a 3,000mAh battery, and ofcourse there is no fast charging. Finally, the Android 8.1 Oreo Go Edition runs out of the box which is a trimmed down version of Android Oreo for entry-level phones. For all this, you have to pay €80, at least in Europe. Since the European pricing remains higher than pricing in other markets, expect the phone to launch in markets like India at a sub Rs 5,000 price tag ($70).